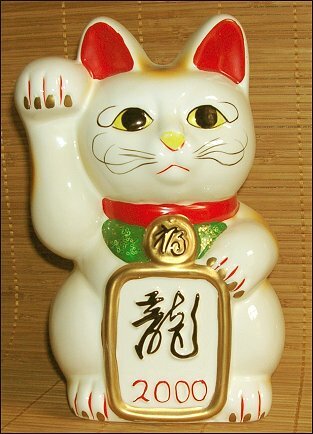 Style #1, the "Tokonames", named after the region which is famous for producing it, is the most popular & also the most common Maneki Neko. And because they are so popular, there are many, many variations to be found -- often made elsewhere from Japan. If you collected only Tokoname-style, you still would be unable to collect them all. A happy kitty! 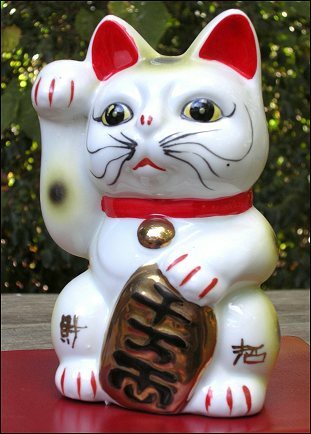 - My 2nd Lucky Cat! I found her in the French Quarter of New Orleans, LA. 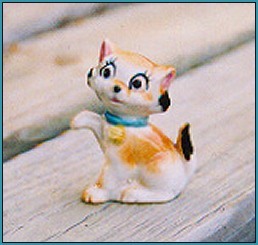 She has a painted red collar with gold bell, a gold "Koban" coin, & a chubby, baby face. Her ears are painted red inside & she resembles a Japanese Bobtail tricolor, known as a "Mi-Ke", with a curled, short tail. She also has a slot in the back of her head so that she can be used as a "piggy" bank. 6" (15cm) tall. This particular Tokoname is unusual in that there are Kanji characters painted on her knees. Also, instead of brown and black spots, she has spots of olive-green & black. Finally, she's made of porcelain - not the usual ceramic. 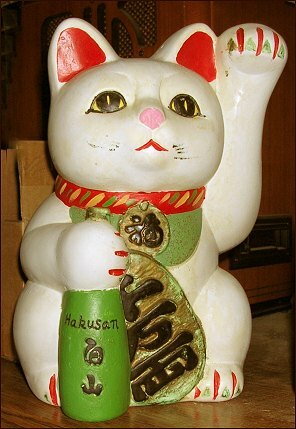 This white ceramic cat is advertising "Hakusan" sake. He's of the Tokoname tribe, but his face is different. Size: 8.5" / 21.5 cm. A bank who has obviously been robbed a few times, he bears no marks or id except the name on the bottle. From eBay, 2008. 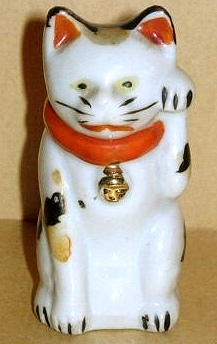 A Mi-ke Maneki Neko made to celebrate the year 2000, Year of the Dragon. (I'm told that the Kanji inside the frame reflects this.) She's 8" (20.5 cm) tall, made of glazed ceramic, and has a slot and stopper for use as a piggy-bank. The rubber stopper is marked with "MADE IN TAIWAN". My 2008 Christmas present from my wife, Bren. 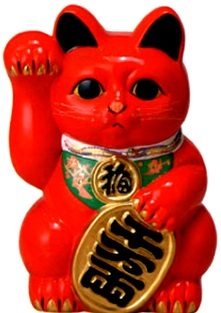 This is a Toko in bright red, with plastic whiskers & a raised right paw. His tag stands for "happiness" & his coin for "lots of money". He's 10" (25cm) tall; made of ceramic; and has a piggy-bank slot in the back of his head. Purchased new from the online seller, "GoodsFromJapan". 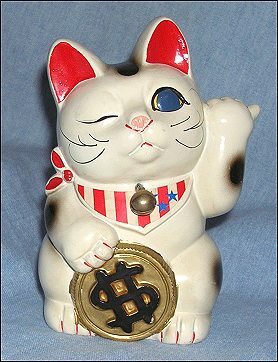 An American Dollar Beckoner from the Okadakurokawadou shop, Japan, 1999. Note the dollar-sign, blue eyes, ribbon bow-tie, & backwards "come hither" gesture. Made for the tourists, methinx! Painted ceramic; 8" (20 cm) tall. Another American Dollar Cat, this one wearing a red, white, and blue bandana. A painted ceramic bank with a real metal bell attached. Height 5 1/4" (13 cm). With a blue & white paper "JAPAN" sticker on the bottom. Purchased used from an online Goodwill store auction, January, 2006. Style #2, the 2nd most popular Lucky Cat group is made up of what I call "Seto Ears-Turned-Sideways". 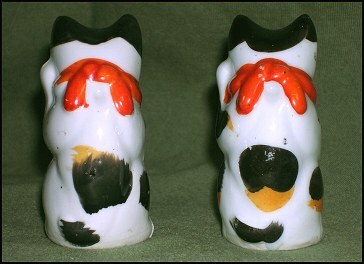 Besides their outwardly turned ears, they feature a sculpted bib or neckerchief, are made of ceramic or porcelain, and seem to have been created from similar molds. And while there are fewer variations, compared with the Tokonames, they still come in a very wide variety of sizes, colors, & decorative patterns -- with the pattern being the most significant feature. Also they're often paired with matching "Nemuri Nekos" (sleeping cats), which are valued collectibles in their own right. The Seto region is no longer the only place these are made. Like the Tokonames, many come from China. And, again, if you specialized, you could still never collect all of them. Many are considered fine antiques and are worth a lot of money. This lovely sky-blue Welcomer Cat is covered with pastel flowers and wears a knotted purple bib. From Bo-Jo's Antique Mall, Memphis, TN, 1998. My third MN! Height 9 inches (22.5 cm); material ceramic. There's a very faded red square on the bottom which might have once identified the maker. 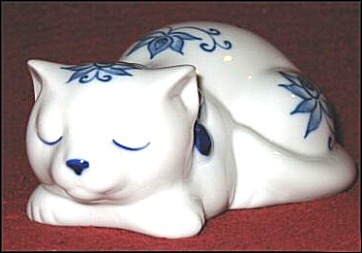 This white porcelain cat is decorated with hand-painted berries. Size: 9.5" / 24 cm. Printed underneath is "Strawberry Vines / Sigma, the taste setter" and there is also a paper sticker saying "Sigma ... Made in Japan". From eBay, 2005. 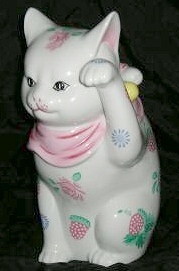 A white porcelain Maneki Neko purchased from my friend, Hawaiian eBay seller "waiapo" of Maui. (December, 2003.) He's 9" (22.5 cm) tall, covered with symbolic lucky "turtle" patterns, and decorated with green enamel moriage. Two very pretty Maneki Nekos. Both of them purchased from Nashville's "Cat Shoppe" about 1 year apart. The cream-colored, flowered one  first caught my eye in 2001, so I passed on the white one  until a year later. Note that they differ not only in color & decoration - their molded collar fasteners are also different. Each is 7.25" (18.5 cm) tall, glazed ceramic. ID underneath: A round gold sticker says "Takahashi (R) / San Francisco 94102 / Made in Japan". Also, it's stamped "HAND-PAINTED / TAKAHASHI / SAN FRANCISCO" - with a square logo. ID underneath: An oval-shaped gold sticker says "Made in Japan". Also, it has a 2-character brown mark (Kutani?) over the words "Hand Painted" in script. 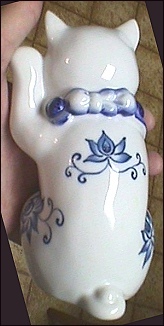 A smaller ETS Maneki Neko in blue-on-white porcelain. From Hawaiian seller "waiapo", (2004). 5.5" (14 cm) tall. With an oval gold sticker underneath: "Andrea by Sadek / Made in Japan". Oft-times a Nemuri Neko (sleeping cat) is made to match a Maneki Neko. (Or the other way around.) I found this little lady on eBay, June, 2005. 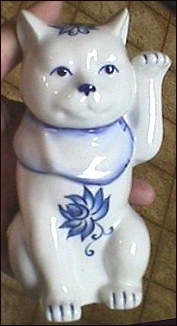 Porcelain, 6.5" (16.5 cm) long, with another "Andrea by Sadek" sticker. From a seller in Los Angeles, CA. "Seto Meiji Porcelain": A traditional Japanese design especially popular with collectors. 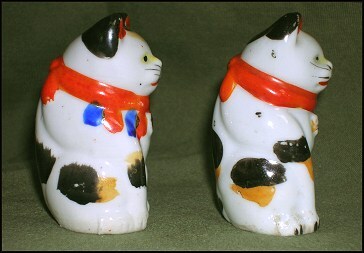 These painted porcelain Maneki Nekos are antiques and, though they may look similar to each other, each is unique in the way it's painted, molded, and/or glazed. They also come in different sizes -- and their worth is often based on size alone, though age and craftsmanship should also be considered. Note: True red is a relatively new thing. The older pieces will be painted with orange-red instead. They also were produced in different sizes & with differently decorated bibs & collars, their most outstanding features. These guys may be difficult to collect, as the ones offered for sale tend to be expensive. ***FYI: The Japanese "Meiji" period lasted from 1868 thru 1912. 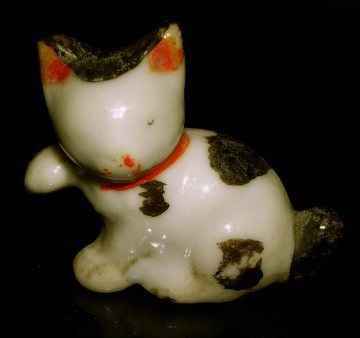 ***FYI2: Sometimes the smaller ones are called "personal lucky cats". 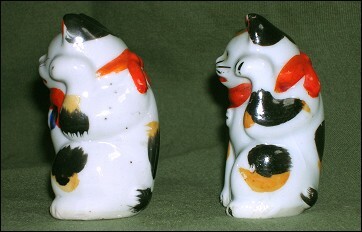 This pair of traditionally styled Japanese Nekos appears to be olde, but I can't be sure. 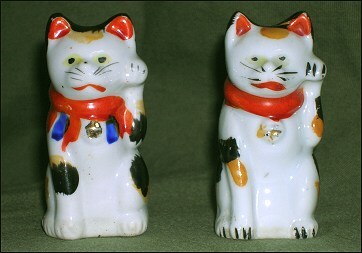 They're both hand-decorated porcelain, 3" (7.5 cm) tall, unmarked tricolor left-pawed, beckoning cats. However: the one  on the left (which came from a US eBayer) has an additional color blue, a more stocky body, and black ash particles embedded in his glaze. The right one  (from a UK eBayer) has sleeker, more pronounced features (especially the raised paw) and, instead of embedded ash, it has tiny gouged places which contain minute specks of black paint ... hmmm. This Meiji cat is almost identical to , above. The molds definitely seem the same. 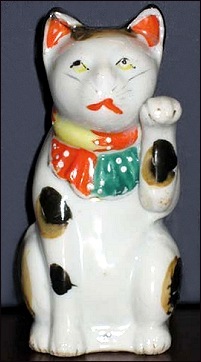 He's made of porcelain, 3" (7.5cm) tall, an unmarked tricolor with his left paw raised -- but he has a differently applied paintjob. Also, there is the same 3/8" (1cm) hole in the bottom of each. From Roz in England, 2007. 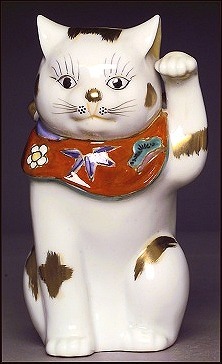 Another 3" (7.5cm) Japanese Meiji Good Fortune Cat in handpainted white porcelain. This one from Steve in California. 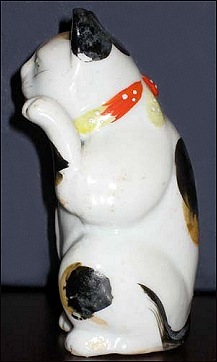 This guy differs a bit from the others in that it is slightly shorter, has round ears & a pudgier face, wears a yellow bell instead of gold, bears only black spots instead of black & brown, has no ash in the glaze (which extends all the way to the bottom), and the tail is much longer, bending to the right instead of to the left. And yet another -- This guy being 4 1/4" (11cm) tall and made of white porcelain. A similar style to the others, but larger, more decorative, and having a much smaller hole in the bottom. (No marks underneath.) From eBayer "jeffmelzucker". 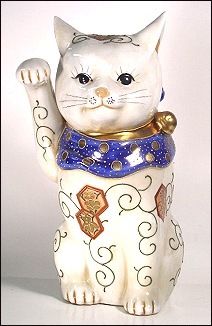 "Body-Turned-Sideways"-style: This is the category for all of those Maneki figurines which have their side to the viewer and their beckoning right paw [usually] stuck out on the left. 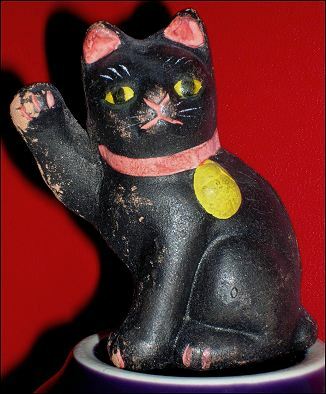 A small black Maneki waving "Hi!". He appears to be olde. He came with an almost identical, mirror-image twin, now living with collector-friend Diane. Size 2.5" (6.5 cm), painted ceramic (solid & of a brick-red color inside), from a California eBayer recently relocated from Japan. ID: an indistinct oval mark impressed into his back. 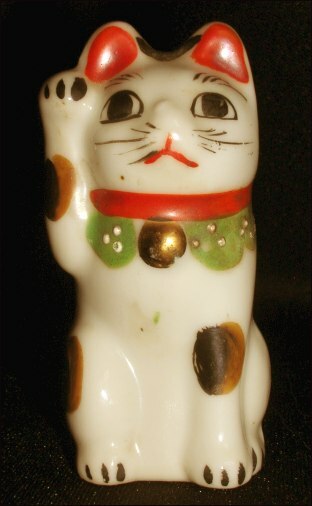 I found this sideways Beckoner in an eBay lot of three cats containing a "regular" Seto Meiji Lucky Cat, this "sideways" Seto Meiji Maneki Neko, &, lastly, a Seto Meiji Neko that was not beckoning. (There's one in every crowd, lol!) 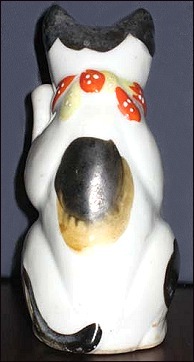 She's white porcelain decorated with orange, yellow, & black, 1 1/8" tall, and stamped "JAPAN" on the bottom in black lettering. A Happy Cat looking a bit chipmunkish. Porcelain, 3" (7.5 cm) tall, with "JAPAN" stamped underneath. Purchased online, 2003, via TIAS. 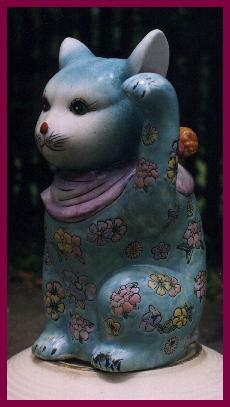 I tend to think of this one as a true manekineko and also, perhaps, his friend below. But there is an element of doubt -- Does that matter?. 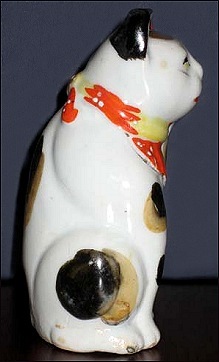 I found this unusual sideways-standing Lucky Cat in a cat-collectibles store called the "Smoky Mountains Cat House", in Pigeon Forge, TN (2000). 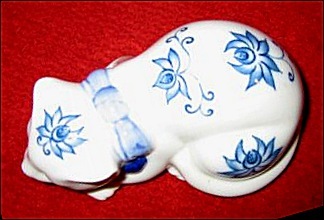 Decorated w/ a blue-on-white pattern, she has characters painted both on her side ("good fortune from now on" & "beckoning for happiness") and beneath her upraised paw ("wealth"). 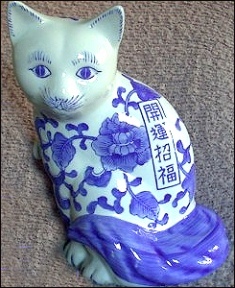 10" (25 cm); porcelain; with a "San Pacific Int'l / SPI / San Francisco, USA / Made in China" sticker.